Patients forced to wait a day in underfunded ER, while MPP Jim Bradley says nothing about Liberal monopoly health-care failures. That’s how long patients with complex health problems wait in the St. Catharines General emergency room. That’s nearly 10 hours more than the provincial average and almost three times the provincial goal of eight hours. The clock starts ticking when a patient checks in at the ER and stops when the patient is discharged or admitted. Waiting for nearly an entire day might seem like a good indication to go elsewhere, but the Niagara Health System says things are not that simple. As of Thursday, getting a look at that entire picture has become easier for Ontario residents. The Ontario Hospital Association launched a website listing how hospitals do in a series of indicators, from ER wait times to infection rates to patient satisfaction. With a click, for instance, you can compare how the St. Catharines General rates against other hospitals in the region or around the province. “The OHA has undertaken to do this because what they found was that Canadians regard their health-care system as part of the national identity and they want to know as much about it as they possibly can,” Demizio said Friday. The OHA site — www.myhospitalcare.ca — is put together using information reported by hospitals to several sources, including the provincial government. Demizio said as reports are issued, the website will be updated. However, even if all the published indicators are taken into account, Demizio said the whole story isn’t being told. In the case of ER wait times in St. Catharines, he said the raw statistics do not explain why the times are so long. “That’s where you can go to a particular hospital’s website for more information. We have been posting this sort of information for some time now,” he said. Wait times are exacerbated because of a backlog of alternative-care patients — patients who no longer need acute care at the hospital but remain there while waiting for long-term care or rehab beds to open up elsewhere. What’s so surprising in this article? - is it that ER hospital patients, in Ontario, Canada (home of mythical-to-some universal single-payer -"national-identity"-health-care) have to wait almost a day (!!) for treatment? - is it surprising that David Caplan, the Liberal health minister, hasn’t yet decided to shut down (or provide only sketchy info to) this site, similar to the way Liberal education minister Kathleen Wynne did recently with the comparisons of schools in Ontario?! Allowing the public to compare the performance of publicly-funded hospitals, or publicly funded schools, is well…gauche, uncalled-for, unseemly, and unfair!! All schools, and all hospitals, everywhere in McGuintyland, are equally the same, don’t you know!! No need to nitpick with pesky comparisons, which then lead to pesky questions about under-funding within a government run monopoly! - is it surprising that no one asks: well, then - where else can patients go if the St. Catharines ER is this bad. . . seeing as that the Liberals are also closing ER's in the southern Niagara tier?! Buffalo? - is it surprising that in this entire article, not one mention was made in reference to the local Liberal health care monopolist, MPP Jim Bradley? The Standard report tells us that patients with complex health problems wait an average of 23 hours in the St. Catharines General emergency room, a wait that is nearly 10 hours more than Ontario’s provincial average and almost three times the provincial goal of eight hours - yet, NO RESPONSE FROM LIBERAL MPP JIM BRADLEY WAS PROVIDED BY THE LOCAL NEWSPAPER!! McGuinty Liberal monopolists are gambling with our health care literally and figuratively. When has the Standard challenged the local Liberal MPP on his government’s lack of progress on the beds issue? This very same issue has been going round in circles for years under the Liberals – and Bradley has never been held accountable for his government’s evasive flip-flopping on the issue. - is it surprising to now 'officially' learn about the long wait-times at the St. Catharines NHS ER? Why, prior to this report, leftist status-quo-praising-health-care monopolists would have us believe that wait times like these were simply ‘anecdotal stories’, ‘atypical’, and ‘not representative of the entire system’…bla… bla…blah…! But this is McGuinty’s Liberal monopoly at work. - is it surprising (in light of what we now know to be extraordinarily-long wait times in our local NHS's St. Catharines ER), that no one bothers to ask Jim Bradley how this relates to the NHS's St. Catharines extraordinarily-high patient mortality rate as was reported by CIHI in Oct.2007; and, how in turn that relates to the Bradley Liberal’s calculated, systemic under-funding of their health-care monopoly’s obligations? - when Demizio mentions that "the whole story isn't being told" . . .
[and again - is it even being asked?! Perhaps only a criminal indictment of the Dalton McGuinty Liberal cabinet could bring about full public access to the Liberal’s record of health-funding decisions, revealing the extent of their calculated ideological manipulation of their health-care monopoly; and revealing the Liberal's simultaneous negligent disregard for patients who are forcibly trapped in this unreasonably-perpetuated, ponzi-scheme monopoly. By Apr.23, 2015, as the Globe reported, Ontario Liberals Jim Bradley and Kathleen Wynne were CUTTING nurse funding again. Please read the article, to understand what Jim Bradley and his Liberal health-monopoly pushing fascist liars are doing. Remember how the St. Catharines Standard reporters ran gleefully to Liberal Jim Bradley, with their tongues hanging out, eagerly waiting for ole Jimmy to blame the Conservatives for 'health care cuts?!! But nowwww... who cares??! The morons who voted for Liberals such as Jim Bradley simply cannot fathom the massiveness of his Liberal's deceptions. Looks like Dalton McGuinty’s Liberal health monopoly is in trouble again, this time at the QHC (Quinte Health Care) in Eastern Ontario, where health minister David Caplan is appointing a supervisor to take over the hospital system. “The provincial government is taking a stand on the financial future of the Quinte Health Care Corporation. David Caplan, Ontario Minister of Health and Long-Term Care informed QHC on Mar. 31 that it is his intent to recommend a supervisor be placed with the organization. The local health-care provider recently presented their government-funding outlet, the South East Local Health Integration Network (SELHIN), with their proposal to eliminate the imminent years of deficit that QHC is currently facing. After months of internal review and a series of public meetings, the organization provided a plan that still left the corporation with a $4 million deficit. As a result, the Ministry states that QHC has failed to implement a plan that will address the current financial situation facing the organization with no extra funding available from the provincial government forcing them to appoint a supervisor to oversee the financial recovery plan. “It had to be done,” says Chairperson for the SELHIN Georgina Thompson. She says that QHC was given a clear mandate to eliminate the deficit and still provided a plan that does not meet that final goal. In a statement provided by his office, the Ontario Minister of Health and Long-Term Care David Caplan says that the recommendation being put forward for government-mandated review for the benefit of the public. President and CEO of QHC Bruce Laughton says that after the months of review that they conducted in order to save money that it was difficult to provide the service they wanted to provide without going into deficit. The Ministry is concerned with the organization’s inability to move forward on a number of recommendations that were made in 2006 from an assessment on governance and other matters including the operation of the Board of Directors. The ministry also suggests that the 2008 report provided by the CEO of the Chatham-Kent Health Alliance Ken Tremblay has not been implemented in the latest recovery plan. Thompson says that the supervisor that will be appointed by the Ministry will review leadership and governance concerns that were raised in the numerous studies that were done on QHC, as well as look at the organization in great detail to see where they can bring the budget out of the red. As for the security of QHC jobs and services during this upcoming government review of the corporation, Laughton says that he does not expect drastic cutbacks to occur within this assessment. But, when it comes to specific items within the governance and representation positions in the corporation, including his own job, all is in the air. We can only hope an Ombudsman’s investigation into the running of the QHC is soon to follow…or is that too much to hope for?? Already the Ombudsman is looking, albeit under a limited mandate, into the restructuring that recently occurred in the Niagara Health System, with its HIP cuts. But a hospital system under an appointed supervisor can and should be now thoroughly examined by the Ombudsman – to see what impact the Liberal’s own health policies, and specifically the actions of Caplan and George Smitherman before him, have had leading up to the situation at the QHC today. The NHS here in Niagara said numerous times over the years that it didn’t have enough funding, which is why it’s in deficit now as well; the QHC’s situation seems little different. NHS CEO Debbie Sevenpifer said that provincial funding will increase by 2.1% this year, yet, costs for drugs, utilities and supplies are growing at 3.5% - which will lead to a $4 million deficit (similar to the QHC's) next year in the NHS. (Niagara This Week, Feb.4, 2009) Maybe, then, Niagara 's system will get taken over by the province soon as well? I mean, how long can McGuinty go underfunding his monopoly, then expecting it to perform miracles? Note what the LHIN's Thompson said: “We have a health-care corporation that is currently not sustainable at the rate that they are going,” says Thompson. “If we want health-care to be sustainable for all the communities that are served under this corporation, then we are going to have to look at any direction to provide the highest standard of health care according to the finances that are made available to them.” "Sustainable"?? Sustainable under what conditions - those of a flicking Liberal monopoly?! "Finances that are made available"?? Don't you mean 'finances that are purposefully NOT made available' by the monopolist Liberals?! Ontario is trapped in a SINGLE-PAYER HEALTH-CARE MONOPOLY - there is NO other choice for this funding, other than FROM THE LIBERAL GOVERNMENT WHICH JUST CUT THE FUNDING!! The common thread is that these 'deficits' are completely artificial, in other words, they were created by McGuinty’s own Liberal government, through systemic cuts to their own health monopoly. The McGuintyite single-payer health-care ideologues - the ones who propagate the glories of monopoly health-care - simply cut their funding, expected their hospitals to cut spending, and expected no consequent impact on service! Yet, the same Liberal ideologues who are demanding that the hospitals cut back and balance their budgets, can’t do the same themselves when it comes to the McGuinty government being billions in deficit this year alone! The bizarre, immoral and perhaps unconstitutional aspect of all this is that McGuinty’s Liberal health-monopoly-pushing ideologues are performing all these manoeuvres while still denying Ontario’s patients the right to by-pass the state-run system, and purchase their health care privately. How long will McGuinty continue to prolong his unsustainable Liberal Healthcare Duplicity? “In various opinion columns, Dr. R. Ouelett, president of the Canadian Medical Association and a self-avowed supporter of having a greater role for the private delivery of heath-care services in our public system, continually distorts facts by comparing our health system to those in Europe in order to advance his agenda. We should, in fact be comparing our system to that of the Americans, not Europe. According to the World Health Organization, all of the European countries, like Canada, spend public money on health care. Among industrialized nations, only the U.S. spends more private money than public (55 per cent). In fact, almost all European countries are less privatized than Canadian health care. (Canada 30 per cent private, U.K. 14 per cent, France 22 per cent, Germany 23 per cent and Sweden 15 per cent). If in fact our system is falling short, the above information shows it is because of greater privatization here, not less. In every analysis and impartial study, the Canadian single-provider system is demonstrably more cost effective and efficient than its American counterpart. It costs 48 per cent less and provides 100 per cent coverage while 47 million Americans have no health care coverage at all. The mostly right leaning press has constantly trumpeted the evils of public health funding compared to private while "business friendly" federal governments cut transfers for Health and Education to the Provinces in order to make their own budgets look better. The deception must stop before we lose a valuable part of what makes Canada a great country in which to live." This is exactly the kind of left-wing populist reactionary mindset Keith Martin mentioned. The usual American-system bashing is trotted out; the obligatory nationalist flag-waving takes place, linking our oppressive (and hopefully soon to be found unconstitutional) statist health monopoly to some mythical grand Canadian national identity; distorted claims are made (Canadians are "100% covered"...what an exaggeration! No mention made of cuts in the government-run monopoly! ); and a (apples to oranges!!) comparison of systems is made, completely disregarding the fact that Canada's is a state-run health-care monopoly, along the lines of Cuba's and North Korea's! It used to be 25 million, then 30 million, then 45 million, now supposedly "47 million Americans have no health coverage at all"! Murri doesn't define 'American' in his scenario, is he including those residing in the States who are illegal aliens? Are they under 24 years of age? Have they failed to enroll in available, existing medicaid programs? Are they residing in covered households earning over 75K? Is the 47-million "not covered at all" number being bandied about by fearmongering lefties not only inaccurate, but an overblown, anecdotal myth? What of Canada's waiting lists and doctor shortages? Why should a state's ideologically-based single-payer monopoly override a patient's right to source and pay for their own health coverage? A state-run health-monopoly is not synonymous to universal health care! "RE: "Compare health-care apples to apples", Letters, April 1. In his letter comparing privatization rates of health-care systems in Europe and the States, writer Richard Murri neglects to compare apples to apples, conveniently ignoring the fact that we have a state-run single-payer health monopoly. Murri neglects to mention that the 'business friendly federal government which cut transfers to the provinces on order to make their books look better', was for over a decade the standard deceptive operating procedure of the Chretien/ Martin Liberal government. Murri perhaps is unaware that U.S. President Obama has wisely dismissed the Canadian single-payer health-care model as a template for U.S. reforms. Murri doesn't mention Liberal Premier McGuinty has said that Ontario already spends half of its budget on health care, and doesn't mention McGuinty incongruously raised a new multi-billion dollar health tax while also reducing coverage. It's long past due for Ontarians to advance beyond left-wing obstructionist agendas, and move towards reforming our sicko state-run health-care monopoly model." Ontario's Liberal-run health care monopoly is rotten to the core, while status-quo-defending leftist reactionaries kill off any seeds of hope for reform. "Contrary to public opinion, Canada does not have “the best health care system in the world.” We actually rank 26th, and yet have the fifth-highest expenditures for health care. So, which countries fare better than us, and why? The Canadian Medical Association (CMA) just examined this question and came up with some fascinating findings. Of the world’s top 20 national health care systems, 17 are European. These word leaders share some common traits: They all have mixed systems that combine both public and private providers; everyone is covered; no one is hurt financially when they fall ill; and there is the widespread use of information technology, which improves efficiency and reduces errors and cost. In some European countries, prescriptions are no longer written — rather, all prescribed courses of treatment are entered into a computerized database which ensures less drug abuse, fewer administrative errors and greater oversight and transparency. Also, the efficient integration of public and private services has actually drawn on the strengths of both systems to ensure that patients get the care they need without being hurt financially. This has enabled countries to even expand coverage to include global prescription drug coverage. The CMA found that in Europe patients are placed at the centre of the health care system. European hospitals are not paid solely by block funding — i.e., a lump sum of money that does not take into account the demands made of them. Instead, hospitals receive monies for services rendered. The medical system therefore treats patients as an asset, because resources are provided for treating each person. These efficiencies free up monies for prevention, health promotion and other initiatives that reduce the demand on our health care system. When Europeans hear that Canadians tolerate atrocious waiting lists of nine to twelve months or more for care, and endure the pain, suffering and loss of function that accompanies these wait times, they are shocked. If they were confronted with these delays in Europe, people would be storming government offices. • Demographic pressures brought on by an ageing population, and more expensive technologies, are outstripping the supply of money that governments have to pay for health care. This structural shortfall will certainly be exacerbated by the current global economic downturn. • The Canada Health Act, and its five principles that govern health care in Canada (public administration, comprehensiveness, universality, portability and accessibility), is broken in every province, every day. • We actually have a mixed system, but it is not integrated in a way that supports our public system. • The status quo is actually contributing to the creeping privatization of our public system and a decline in the services that are covered. The lesson we should learn from the Europeans is that the absence of competition leads to inefficiencies in our health system, a dearth of innovation and compromised care. If we fail to modernize our health care system and live with the illusion that we have the “best” system, more and more people, particularly those of modest means, will fail to receive the care they need. This would be a national disgrace — and an entirely avoidable one at that. We can have the best health care system in the world, but we must adopt those solutions that will allow us to achieve this noble goal. We must have courage and we must not fear change." Of course, St. Catharines MPP (and Liberal health care monopolist) Jim Bradley knows all about Keith Martin's views - because two and a half years ago, on Sept. 20, 2006, I had written to Bradley asking him then to respond to his federal Liberal cousin MP's views. I asked Jim Bradley to comment on Keith Martin's article "Four ways to fix health care" (National Post, Sept.16, 2006), as well as John Turley Ewart's article "Where's the debate on medicare?" (National Post, Sept.9, 2006). I asked Good Ole Jim to comment on the St. Catharines Standard's Aug.26, 2006 editorial, "Finding sustainable health care solutions", as well as John Carpay's article, "Chaoulli comes to Alberta", (National Post, Sept.19, 2006). I brought to MPP Bradley's attention my letter, "Consumers have a right to choice in health care", (St. Catharines Standard, Sept. 6, 2006) - but our smug Liberal, Jim Bradley, couldn't give a flicking whit about what Martin, or anyone else, wrote. Bradley, our local Niagara single-payer-state-run-health-care-monopoly-inflicting-ideologue, simply hid - and still does - from explaining what his government is doing. When Martin writes of those "who stick their heads in the sand", who immediately squawk about "American style two tier" whenever Ontario health care reform is mentioned, the definitive poster-boy for this Liberal tactic was none other than Niagara's knee-jerk obstructionist, Ole Liberal MPP Jim Bradley! "The benefits of privatization result from key differences between how the private and public sectors behave, and the incentives each faces. For example, the public sector generally uses less capital and is more labour intensive than the private sector. As a result, state-owned enterprises tend to be less productive. Another essential difference is that governments are preoccupied with fulfilling political goals rather than pursuing economic or business objectives. Instead of allocating capital where it garners the highest economic return, governments typically allocate capital to areas that maximize their chances for re-election. In addition, government businesses usually operate in a state-provided monopoly shielded from competitive discipline. This means they are not required to constantly update their technologies and production processes and/or offer innovative products and services to their customers. In the private sector, competition forces firms to regularly invest in new capital and meet consumer demand in order to survive and grow profitably. Finally, government budgets are “soft” since it is impossible for them to go broke. Private sector businesses, however, face “hard” budget constraints. If they incur sustained losses the decline of capital will push them into bankruptcy. The private sector must therefore provide its customers with the quality goods and services they demand, in a timely manner, and at affordable prices. The public sector simply does not face the same pressures." Bradley and his McGuinty Ontario Liberals are simply, it appears, treading water until the McCreith - Holmes health care challenge against their government is finally settled. Until then, their authoritarian Liberal statist monopoly, Ontario's provincial disgrace, will tumble along, with its monopolist head in the sand. below: the same view, earlier, on Apr.3, 2009 - Why doesn't Mayor McMullan flick off the lights during the daytime in Montebello Park? above: Apr.3, 2009, all the lights in the park were on in the day. below: Apr.3, 2009, the American flag is on the bandshell. Funny how green-pandering hypocrite city politicians who spout enviro-crap policies can't figure out how to shut the FLICKING (as McGuinty Liberals would say) lights off during the day in their own downtown park. Why isn't this high-cost, wasted energy being metered through a 'smart meter', and being deducted from the salaries of the mayor and his council? Has our hypocrite green mayor calculated the carbon footprint of his own ineptitude? Other outlets in this same chain only charge a total of $4.20 for the exact same order, as only the 5% GST applies, ie $4.00 x 5% = $4.20. Federal auditor Sheila Fraser yesterday in her report mentioned that the federal government should be looking at all the tax revenue being lost in the hidden underground economy. 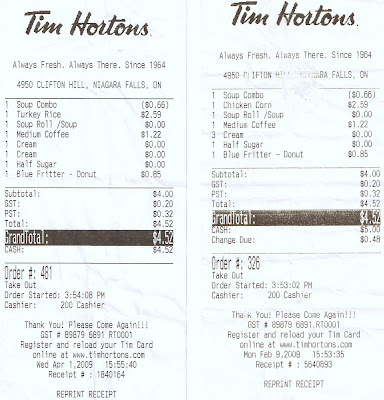 For some time now, a Tim Hortons Niagara Falls coffee outlet has been openly charging an 8% Provincial Sales Tax (PST) on food sales of $4.00 – but food sales $4.00 and under are supposed to be exempt from the PST. The customer is being charged a total of 13% tax on a $4 snack!! Why is this allowed by Ontario’s Liberal government? Are the provincial Liberals not spending enough resources to monitor and enforce their own tax policies, being openly flaunted at the retail level? What is Kim Craitor, the Niagara Falls Liberal MPP, doing about this? How many operators in Niagara Falls are overcharging or improperly calculating the taxes on bills they hand to customers? It’s bad enough that tourists at various Niagara Falls, Ontario, hotels and restaurants are being hit with a confusing, privately-run fake-tax, the so-called “destination marketing fee” (DMF), which mimics real (ie government-sanctioned) DMF's that are legitimately in place in other Ontario cities. How many customers even know that they are being ripped off if they pay 8% PST on a snack selling for $4.00 or less; that only the 5% GST applies? How many visitors are aware that they have NO obligation whatsoever to pay any DMF being shoved onto them in Niagara Falls, Ont? The local MPP, Kim Craitor, has emphasized that point - yet his Liberal government continues to allow the current non-government-sanctioned DMF to operate un-regulated. And why are Phony Sales Taxes allowed to be charged in Niagara Falls, Ont. ?